More farm women in Iowa raise beef cattle than any other type of livestock or poultry. While 85% of Iowa beef farms market less than 100 head annually, the profitability of the cow/calf herd or beef feedlot impacts family finances significantly. 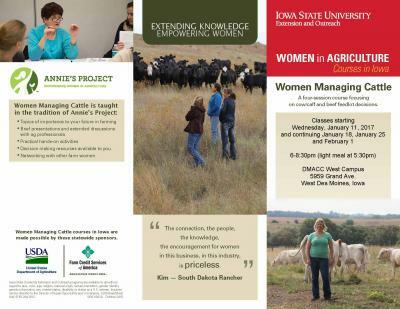 Whether women just want to learn more about Iowa’s beef industry, or need to find more profitability from their family cattle business, this course offers something for everyone. Sessions cover marketing strategies and managing land and water resources. 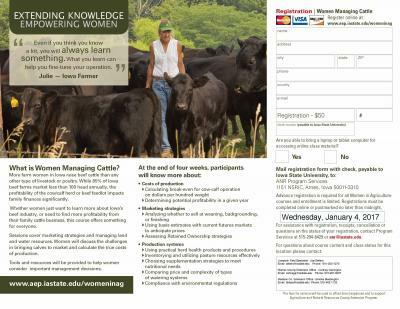 Women will discuss the challenges in bringing calves to market and calculate the true costs of production. Tools and resources will be provided to help women consider important management decisions.